Elmer Gantry (1960) is Burt Lancaster‘s movie. He plays the title character, a charismatic but aimless hustler who becomes involved in a 1920’s American religious movement. He loves the energy of dynamic religion, but equates it to selling a product, like hawking ice cream. Lancaster is at his scenery-chewing best here, with untamed hair and outsized personality. We want to be enticed by his oily charm, and we can’t wait to see what he does Next. Therefore, to be any other cast member in this film would be difficult, although Shirley Jones did win an Oscar for her portrayal of a wayward young woman whose life was ruined by Lancaster. Arthur Kennedy is superb as a cynical journalist who sees through Lancaster’s bluster, and likes him anyway. The toughest job in this film belongs to Jean Simmons. Simmons is the female lead – a woman evangelist spearheading a large revival. Her character is a pious woman whose only earthly indulgence seems to be her fashionable wardrobe. This single-minded woman has a Job To Do, and she won’t easily be consumed by Lancaster’s scene-stealing charisma. But, like everyone else, she eventually succumbs to Lancaster’s odd charms. Simmons’s character, Sister Sharon, has an expensive vocation. She saves souls, feeds the hungry, and heals the sick, but these things cost money. Every time she Sets Up Shop in a new town, she’s starting From Scratch. Sister Sharon is All Business off-stage, but amusing and theatrical when she’s preaching. She knows how to handle an audience. In one scene, Simmons’s character confronts a hostile crowd. She falls to her knees and prays; a small, fragile figure who refuses to be bullied. The naysayers love her for it. Yet, she’s not invincible. After an intense preaching session, she collapses from exhaustion. Simmons’s Sister Sharon is always On for personal appearances, but is often drained afterwards. In another scene, she tries to heal a man of deafness. She places her hands on his ears, and says, “Heal. Heal!” She repeats herself, desperate for him to hear, desperate for faith to be rewarded. Simmons makes us feel her anxiety, her determination to prove the sick can be healed. Too bad she’s an imposter. She’s a phoney – and a genuine believer. Elmer Gantry is based on the 1927 novel by American author Sinclair Lewis. As you might imagine, a novel about religion was controversial and Hollywood studios were reluctant to finance a film adaptation. The film skewers hypocrites, but it offers a sympathetic portrayal of Simmons’s character. McPherson settled in Los Angeles in 1923 where she built the Angelus Temple. “In a city full of movie stars, Aimee Semple McPherson was poised to become the biggest celebrity of all,”² writes historian Gary Krist. As far as we can tell, Simmons captures McPherson’s essence, a female evangelist in an era when such a thing was rare, a resolute woman who wrote a new religious playbook. Elmer Gantry, the film, was nominated for five Oscars and won three. Simmons was not nominated for an Oscar, but she was nominated for a Golden Globe and a BAFTA Award. 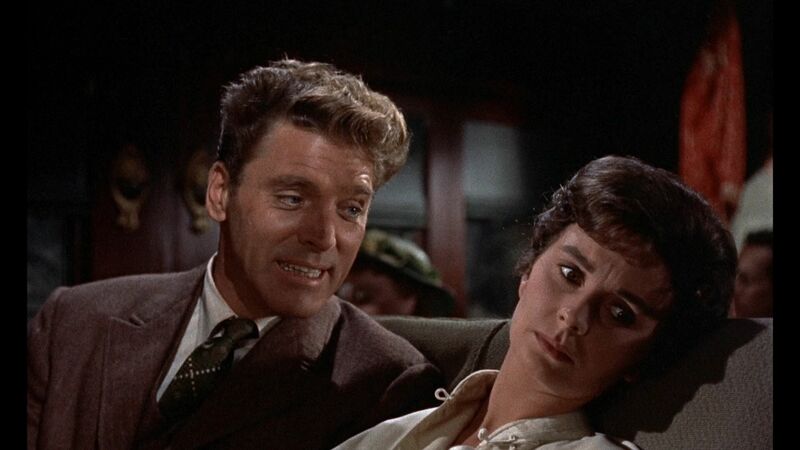 The film is a study in Acting, especially when it comes to a female lead who refuses to be swallowed by Burt Lancaster’s shadow. 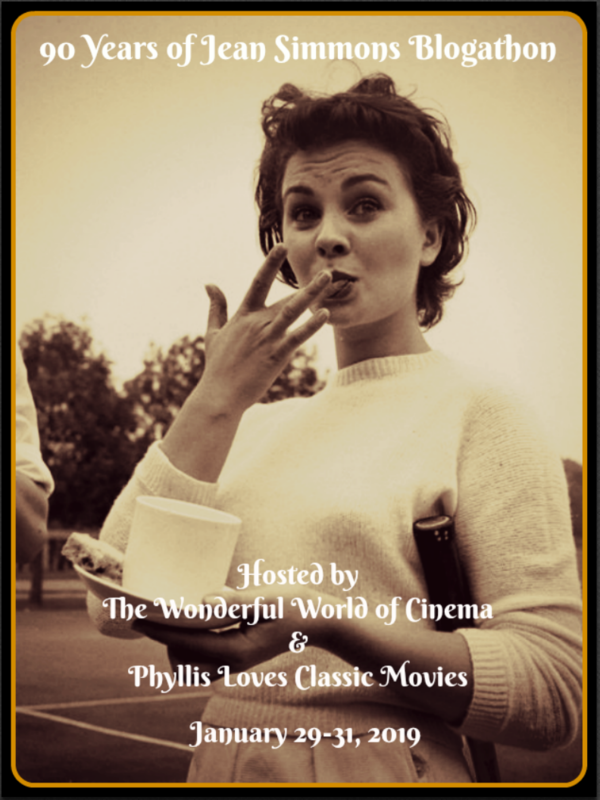 This post is part of the 90 YEARS OF JEAN SIMMONS BLOGATHON hosted by The Wonderful World of Cinema and Phyllis Loves Classic Movies. 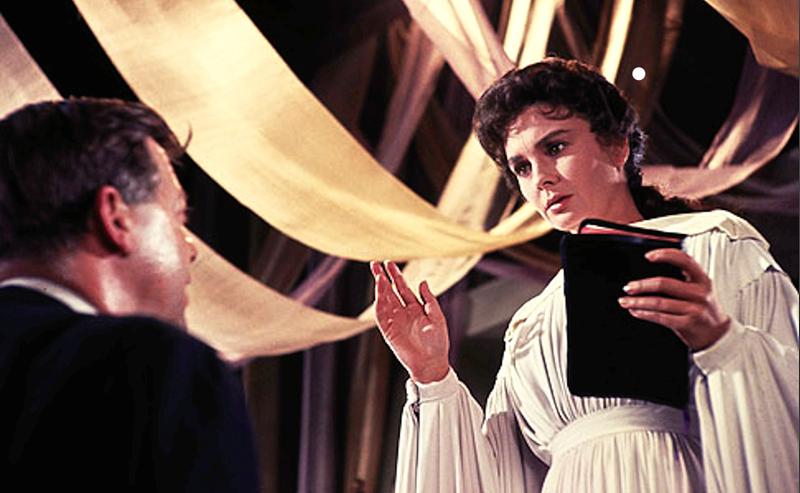 Elmer Gantry: starring Burt Lancaster, Jean Simmons, Arthur Kennedy. Written & directed by Richard Brooks. United Artists, 1960, Colour, 146 mins. Krist, Gary. (2018) The Mirage Factory: Illusion, Imagination and the Invention of Los Angeles. New York, NY: Crown Publishing Group. Side note: Five years earlier, Jean Simmons played another “sister” (Sister Sarah) opposite Marlon Brando in GUYS AND DOLLS. Some critics thought Brando was miscast, but not me, As for Jean Simmons, she was seldom, if ever, miscast! Oh yes, that’s right! I’d forgotten about that. As for Jean Simmons, I agree. She never lets an audience down. Lancaster is like a giant in this film, isn’t he? It takes a special actress to not be swallowed up by that big personality, and Jean Simmons is the one to do it. Nice! I agree Simmons had a tough role here with larger-than-life Lancaster on one side and future-Oscar-winner Jones on the other. I think she should have been nominated for an Oscar as well, as the film is about tricksters and pretty deplorable (but very human) people and Simmons, for me, managed to make her character both deplorable and likable. Not an easy thing to do. Why wasn’t Simmons nominated for this role – do you know? Every time I see this film, I wonder. Like you said, she had a tricky role here, and she manages it effortlessly. One of the crown jewels of Jean Simmons movie career. She dissected the layers to Sister Sharon seamlessly and the believability of her character gives the audience the freedom to explore all of those around her. So true! 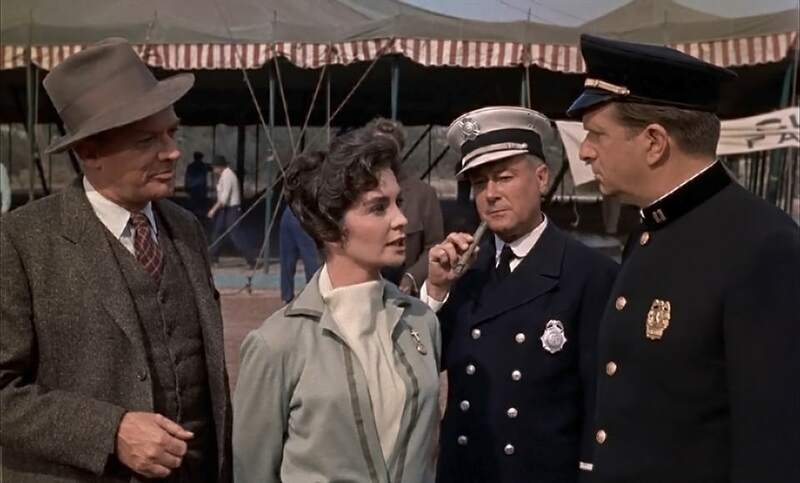 Jean Simmons’s performance never misses a step, so it gives us a chance to fully explore how her decisions/actions affect the outcome of the film. I agree this role is one of the crown jewels in her career, as you said. I haven’t seen “Miracle Woman”, but it the two plots don’t sound that similar. This is a film that never previously quite appealed to me, perhaps because of how the story was often told, usually with a focus on Burt Lancaster’s character. But your description of Jean Simmons, as a phony and a believer, sounds extremely interesting and does make me think a bit of The Miracle Woman, too, which is a film I really enjoy. I’ve not seen Jean Simmons in many films, but recently saw her in The Big Country and thought she did very well, considering all the scene-stealing male actors in the film. Simmons can certainly hold her own, can’t she? She seems fragile and thin as a person, but her characters are tough. Also, it’s good to see you in the blogosphere again. 🙂 I hope all is well. I’ll definitely have to give more of her films a try, then! Thanks! It feels good to be in the blogosphere again. 🙂 I had a bit too much going on and fell out of the rhythm of blogging, but I missed it. It’s likely me – maybe I didn’t properly sign up for this. I was going to leave a link on your announcement post on Monday. Looking forward to this! No problem Ruth! You subcribed correctly. 🙂 I’m impatient to read your article! 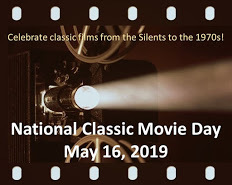 (Too busy for the moment but I will when the blogathon starts)! I don’t think it’s one of Jean Simmons’ best performances, but then I never thought she gave a bad one. She’s convincing in the part and Burt Lancaster is perfect in the lead. I love Shirley Jones, but always thought she was miscast despite winning an Oscar. I agree re: Shirley Jones. She’s terrific in the role, but I don’t really buy her as Lulu. I love all the history you bring into these reviews–such a pleasure to read! Love Jean Simmons. I feel she was somewhat of an underrated actress during her prime. She got her due much later. But she was a brilliantly talented actress, who could handle anything thrown her way. Elmer Gantry, sounds worth watching mainly thanks to her. I ought to check it out. This film has terrific performances, although Burt Lancaster is a scenery-chewer here. Also, it’s an interesting story – and study in hypocrisy – and I’d be really interested to know what you think when you do see it. Brilliant article Ruth! I’m so glad someone decided to cover this film for the blogathon as it is a personal favourite of mine. I loved your nuanced take on the film itself and on Jean Simmons characther. This surely was an interesting role from her. In my opinion she should have been nominated for an Oscar but I’m glad she was at least nominated for a Golden Globe and a BFTA Award (something I didn’t know before reading your articles). Thanks so much for your participation! I was surprised to learn Jean Simmons wasn’t nominated for an Oscar in this role. I felt she captured the essence of the character – a determined female in charge of a large organization when such a thing wasn’t done. Wonderful post focusing on Jean’s acting! It certainly sounds like a difficult role to take on! Thanks for participating in this blogathon! Michael Caine on 1960s London: "Everybody Seemed to Become Famous"
© silverscreenings.org, 2011-2019. Unauthorized use and/or duplication of this written material without express and written permission from this site’s author/owner is strictly prohibited. Excerpts and links may be used, provided that full and clear credit is given to silverscreenings.org with appropriate and specific direction to the original content.